My gardening story in detail is in the very earliest posts in this blog series. It had its beginning in the old house which now no longer exists. During the young days, besides a rubber hose pipe, two tools were always handy in the yard. I grew up handling them for many years. One was a hoe-pickaxe illustrated above. It was a small but wonderful tool, its slender wooden handle was simple, sturdy and beautifully rounded. One fine day, it was not found near the bushes where it was sometimes left. Someone had stolen it climbing the tall compound wall. The heavy, black rubber hosepipe was also went missing the same night. The second tool was the small hand rake with four curved teeth. It is still in use after probably 50+ years, even having lost one tooth during service. I have it displayed in the above picture - next to the blue handle trowel. The water can is also vintage with its 'shower flower' being of my time. Click on the pictures for a magnified view. The above picture also shows my additions in later years when I started gardening myself. Soon after the hoe-pickaxe was stolen, we were handicapped. My grandfather was alive then. So he requested his favourite client Salar Masood Sahib on Ashoka Road to buy a replacement for it. He did so, but it was of low quality. You can see it in the above, with a rubber grip and one 'finger' folded! I bought a good rake a 8-9 years ago. You see 4 other tools. A small pickaxe and a small mason's trowel. The large trowel as broken by some mason during work some years ago. We had a hedge clipping scissors which had broken. 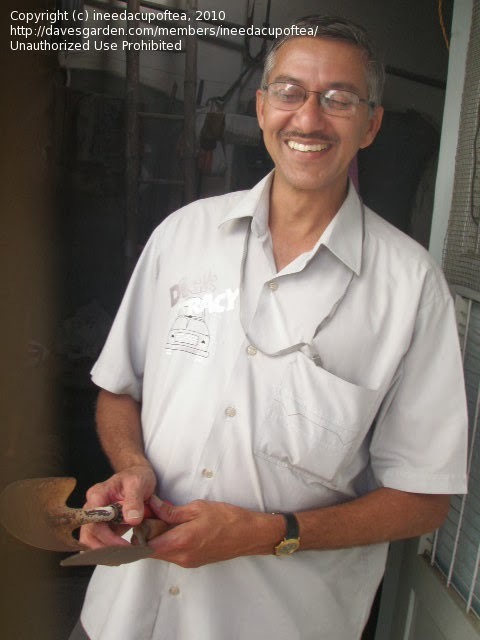 My friend Ramu got its handle fixed to the trowel. The round thing on the right is a broken saddle frame of the bicycle - handy for piercing potted soil and removing weeds. In the above you see the ones I do not use often. The last is a cocunut shell remover. The other three are heavy ones, may be 60 years old. All of them have handles from branches of gooseberry tree, known for its strength. The handle of my favourite trowel was broken. I inserted a sturdy piece of water pipe after softening it with heat last week. The garden tool shed I made by recycling old doors and a grill [not seen here, but in a different post in detail]. I store all of them here, which earlier was inside the house in corners and passages. Every gardener has his favourite tool. I am no exception. When Kenton visited me from the USA in 2010, he wanted to know which are my favourites and I showed these. "The best place to seek God is in a garden. You can dig for Him there." - Sir George Bernard Shaw. With them, I have sought and got! Great picture of you, Dinu! And, oh, I needed these wonderful garden shots this morning. And, oh, oh again: I need to get me some chickpeas so I can have more energy too! Happy gardening, my friend!